Urinary Tract Infections, better known as a UTI, are extremely common in puppies. The puppy’s frequent urination and inability to control when and where he goes is often misinterpreted by pet owners as a behavioral problem. However, misdiagnosing a UTI as a behavioral issue can actually result in ineffective house training – which is why it is important for owners to recognize the symptoms of urinary tract infections early. UTIs are most commonly the result of a bacterial infection. A puppy can develop the infection if he is unable to urinate for long periods of time and the urine sits in his bladder breeding bacteria. The bladder and urethra then become infected and inflamed, resulting in the urinary tract infection. This is why many shelters and breeders require those adopting puppies to have a schedule which will permit them to give the puppy frequent bathroom breaks. Urinary tract infections in dogs can also be caused by bacteria in the kidneys, a fungal infection, or a virus. If your puppy is displaying any of these symptoms, he likely has an infection and should be taken to the vet for proper diagnosis. While a urinary tract infection is painful and uncomfortable for your puppy, it is generally not life-threatening. However, misdiagnosis can interfere with house training and result in accidents that are beyond the puppy’s control. In rare cases, a UTI may also be a sign of an underlying problem like Cushing’s disease in dogs, bladder stones, canine kidney failure, diabetes in dogs, or even bladder cancer. And if left untreated, a UTI can cause permanent damage to your puppy’s kidneys. So it is important to have a vet examine and properly diagnose you puppy. To diagnose a UTI, your veterinarian will perform a urinalysis to check for an infection and evaluate kidney function. Further diagnostic tests such as a culture or bloodwork may also be completed in order to determine the type of infection and rule out other health concerns. Your vet may also choose to take x-rays of your puppy to see if there are any stones or abnormalities in the urinary tract or bladder. The exact course of treatment will depend on your puppy’s specific case, but will likely involve antibiotics to eliminate the bacteria present in the body. Your vet may also recommend fluid therapy to help flush out the urinary tract and kidneys. If your puppy appears to be in a lot of pain, the vet may also prescribe pain medication to help. If bladder stones are present, surgery may be required to remove them. When administering antibiotics to your puppy, it is important to follow your veterinarian’s instructions explicitly. 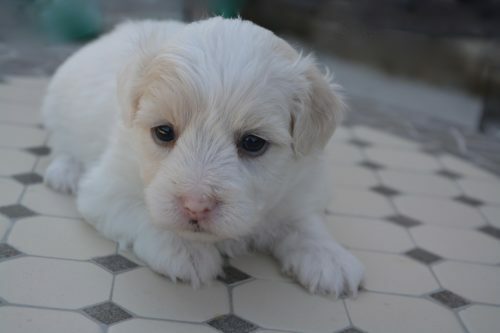 Do not stop the antibiotics until directed, even if your puppy appears to be feeling better. If the round of antibiotics is not completed, the UTI could recur. Drink Water: Encourage your puppy to drink plenty of water by ensuring that a full bowl of clean and fresh water is always available. Cool It Down: On hot days, toss some ice cubes in your puppy’s bowl to help cool the water down. Use Flowing Water: Many dogs and puppies like to drink from running water. If your puppy is particularly adverse to a bowl, consider purchasing a pet drinking fountain. Give Probiotics: If your puppy is experiencing chronic UTIs, ask your vet if probiotics might help. Keep It Clean: Be sure to frequently clean your puppy’s bowls to keep them clear of bacteria and mold. This is especially important when your leave food and water out all day for your puppy to consume freely. Switch Food: Again, if your puppy is prone to UTIs, talk to your vet about switching to a dog food made specifically to promote urinary tract health. 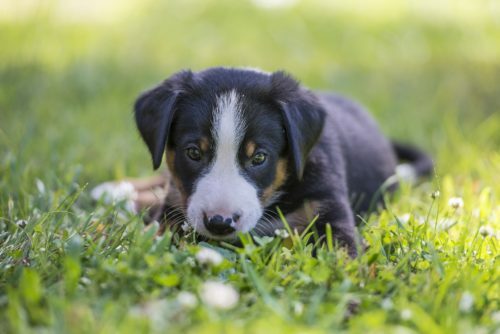 Get a Checkup: An important step in keeping your puppy healthy and happy is to have annual checkups, which will help avoid health issues like UTIs. Becker, Marty. “Does Your Dog Have a Urinary Tract Infection? Learn the Symptoms.” Vetstreet, Accessed 9 Oct. 2017. www.vetstreet.com/dr-marty-becker/does-your-dog-have-a-urinary-tract-infection-learn-the-symptoms. Alt, Kimberly. “How to Treat UTI in Dogs: Home Remedies and Medicine Options.” CanineJournal.com, 9 Jan. 2018, Accessed 9 Oct. 2017. www.caninejournal.com/how-to-treat-uti-in-dogs/. Burke, Anna. “Noticing Dog UTI Symptoms? It Could Be Something More . . .” American Kennel Club, 1 Sept. 2017, Accessed 9 Oct. 2017. www.akc.org/expert-advice/health/noticing-dog-uti-symptoms-could-be-something-more/. Meggitt, Jane. “Puppy Urinary Tract Infection Symptoms.” Cuteness, 18 Sept. 2018, Accessed 9 Oct. 2017. www.cuteness.com/article/puppy-urinary-tract-infection-symptoms. “Lower Urinary Tract Problems and Infections in Dogs.” WebMD, Accessed 9 Oct. 2017. www.pets.webmd.com/dogs/guide/lower-urinary-tract-problems-infections-dogs#1.